City Light’s five community solar sites are sold out! Community solar is a way for City Light customers who can't or don't want to purchase their own solar systems to add solar to the grid and receive the benefits that come with owning solar panels, but at a size and cost that works for them. You don't need to own a system, and you don't even need to own a home. Solar energy is in the news a lot these days. This may have prompted you to think about "going solar." But what if putting solar on your own home or business isn't for you? Too much shade? Too expensive? Don't own your own home? Thinking of moving soon? All of these can be barriers to installing solar on your own. However, that doesn't mean you can't go solar. Like a community garden or P-Patch plot that provides garden space for an apartment dweller, a community solar array lets renters, condo owners, or those who don't want to buy a whole system get the benefits of a solar array shared by the community. Seattle City Light pays to build and maintain a large solar array in a location optimally situated for solar exposure and chosen for its community appeal. The array generates electricity to the Seattle City Light electric grid, which further diversifies our clean energy power sources. Anyone with a Seattle City Light electric account can sign up to purchase solar units consisting of a share of the total output of the community solar array. Each year through 2020, the utility credits participating community solar customers for their portion of the power produced by the community solar array. Plus, participants receive a Washington State Production Incentive specifically designed for community solar customers, which is double the production incentive paid to individual customers who generate solar electricity on their homes. These payments are based on the customer's participation level. In 2012, Seattle City Light completed its first community solar project at Jefferson Park in the Beacon Hill neighborhood. 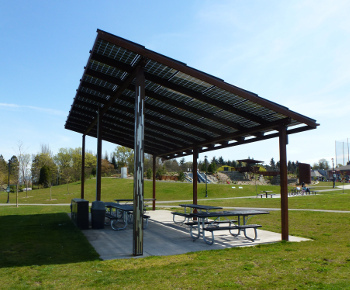 Participating customers helped build three new picnic shelters with roofs made of solar electric panels. The site now generates approximately 26,000 kWh of clean, renewable electricity each year, while supplying park visitors with much needed shelters. Live data from Jefferson Park. Community solar at the Seattle Aquarium opened for enrollment in September of 2013 and sold out the 1850 available units in 6 short weeks. This 44.4 kilowatt system is ideal for its historic waterfront location that hosts more than 800,000 visitors a year (including 40,000 school children), a large south-facing unshaded roof, and its significant contribution to the Aquarium's conservation and sustainability mission. Live Data from the Seattle Aquarium. Seattle City Light built two community solar projects in 2014, including the 74.79 kilowatt Phinney Ridge Project (SOLD OUT as of 12/11/14) and a 25.92 kilowatt Capitol Hill EcoDistrict project (SOLD OUT as of 5/4/2015). Each project brings something special to its host, our community, and the participants. The Capitol Hill project went live in 2014 and is an exciting addition to the Capitol Hill EcoDistrict. Visit our Current Projects page to find out more about the Capitol Hill project as well as general information on all the projects, and check out our community solar FAQs.